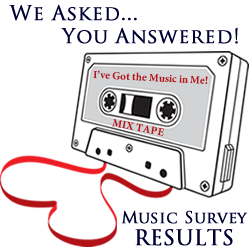 Just for fun and to help everyone build their playlists, we launched a survey toward the end of March called “I’ve Got the Music in Me! Music is such an important element in business that asking about your favorites and posting them would help everyone including us, build their playlists. Big Winners – “Eye of The Tiger” by Survivor. “We Are The Champions” by Queen, “Celebration” by Kool and the Gang, “Footloose” by Kenny Loggins and Blake Shelton, and “I Gotta Feeling” by the Black Eyed Peas. Classical music and rock were the winning genres. Click here for the results report and check out some great playlists linked on the right! Thanks to all who participated, we hope you enjoyed it. We use surveys for many business purposes with our clients. If you are interested in learning more about our survey capabilities. Please let us know. * You must have a Spotify account to listen.